Commonwealth General scholarships program for year 2015 is offering for Pakistani applicants in commonwealth countries. 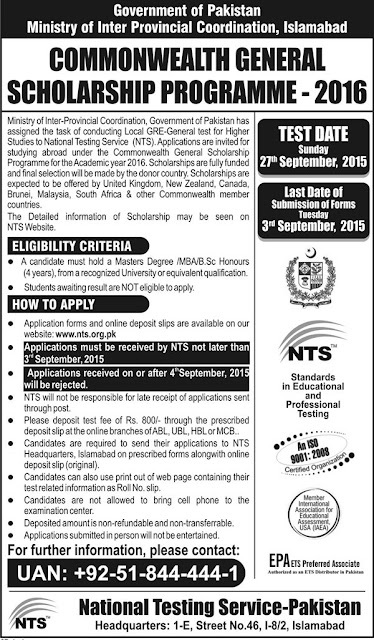 The Ministry of Inter Provincial Coordination, Government of Pakistan has assigned the task of conducting the Local GRE-General test for Higher Studies to the National Testing Services (NTS). These scholarships are fully funded and final selection will be made by the donor country. Scholarships are expected to be offered by United Kingdom, Canada, Brunei, New Zealand, Malaysia, South Africa and other commonwealth countries. Attach all academics records and certificates with the application form.